In an early article (1905) in Symons’s Meteorological Magazine by the Rev. R.P. Dansey, it is asserted that the high gullies to the east of the summit of Ben Nevis contain two glaciers. In the article he allows that these features are not glaciers in the sense that “they are not fed permanently by high level snows as are real glaciers” but he quotes the Rev. A. E. Robertson (the first person to complete all of the Munro summits in 1901) who says “I think also they would show glacial movement as well, so if that makes it a glacier, then I think you have it on Ben Nevis” (Dansey, R. P. 1905. The Glacial Snow of Ben Nevis. Symons’s Meteorological Magazine 40. 29-32). “…it appears probable that the nearest approach to glaciation in the Scottish Highlands was reached in the 1740’s and again about 1809-18;…we cannot claim that a glacier is likely to have established itself” (Manley G. 1949. The Snowline in Britain. Glaciers and Climate: Geophysical and Geomorphological Essays. Geografiska Annaler 31). “…it seems that extensive permanent snow beds or even inactive glacier ice existed as recently as the late seventeenth century” (Sugden D E. 1971. The Significance of Periglacial Activity on Some Scottish Mountains. The Geographical Journal 137. 388-392). 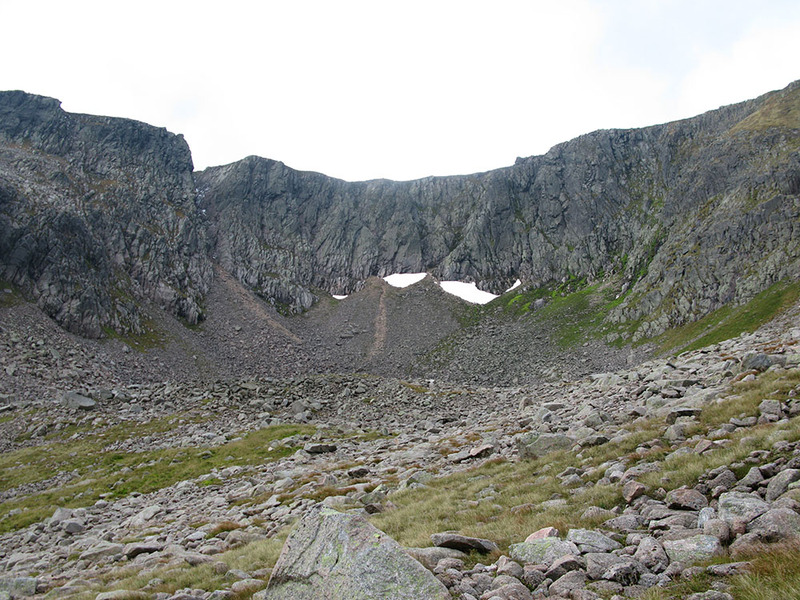 The original fieldwork in the corries of the Cairngorms that prompted the theory that small glaciers existed relatively recently in these corries was carried out by David Sugden of Aberdeen University Department of Geography in 1964. Sugden’s analysis of his fieldwork results took the form of dating of Rhizocarpon Geographicum lichen growing in the corries, by measuring and comparing relative diameters of lichens – a technique known as lichenometry. Interestingly he says “there are numerous situations in the world where glaciers have crossed weak deposits such as peat without removing them” (Sugden D E. 1977. Did glaciers form in the Cairngorms in the 17th-19th centuries? Cairngorm Club Journal 97. 189-201). “This snowfield (Garbh Choire Mòr south of Braeriach) was the source of a Coire Glacier during the previous centuries. Measurements of lichen growth have dated two moraines at 1740 and 1810″ (Hudson I C. 1977. Cairngorm snowfield report 1976. Journal of Meteorology 2. 163-166). Sheila Rapson argued that ‘active ice’ cannot have existed in 3 corries with boulder moraine ridges in the Cairngorm mountains since 6000-9000 years ago, as organic sediments retrieved from the lochs in these corries have been radiocarbon dated to those dates (and the assumption is made that ‘active ice’ would have removed this organic material, an assumption that is at odds with what Sugden said in his 1977 CCJ article) – but does say the corries may have contained ‘permanent snow’ during the period of the Little Ice Age (Rapson, S. C. 1985. Minimum age of corrie moraine ridges in the Cairngorm Mountains, Scotland. Boreas, 14. 155–159). Sheila Rapson also subsequently pointed out that David Sugden’s original lichen cover research from the 70s that prompted the theory that glaciers existed in the Cairngorms in the 17th century was not completely negated by her later research, at least in the case of Garbh Choire Mòr of Braeriach. She makes the tentative suggestion that “the coire, because of its high altitude, accommodated a true glacier during the Little Ice Age” (Rapson S C. 1990. The age of the Cairngorm corrie moraines. Scottish Mountaineering Club Journal 34 (no. 181). 457–463). Adam Watson suggests that the ‘moraine’ at the foot of Garbh Choire Mòr, mentioned by Sheila Rapson in her SMC Journal article of 1990 is probably not a moraine formed by a glacier, but instead is a protalus rampart. This would explain the relatively recent date of formation, and would not require the existence of glacial ice to form, instead being formed by rockfall from cliffs onto a large snowpatch at the foot of Garbh Choire Mòr (A snow book, northern Scotland, Paragon Publishing, 2011, Pg. 67). The two new papers are the most recent contribution to this long-running debate, and have generated a lot of discussion and received some attention in the media. The research was mentioned in an article on the BBC news website here. There is also discussion about this research on the Mountaineering Council of Scotland (MCofS) website here, the ukhillwalking.com website here and the University of Dundee website here. 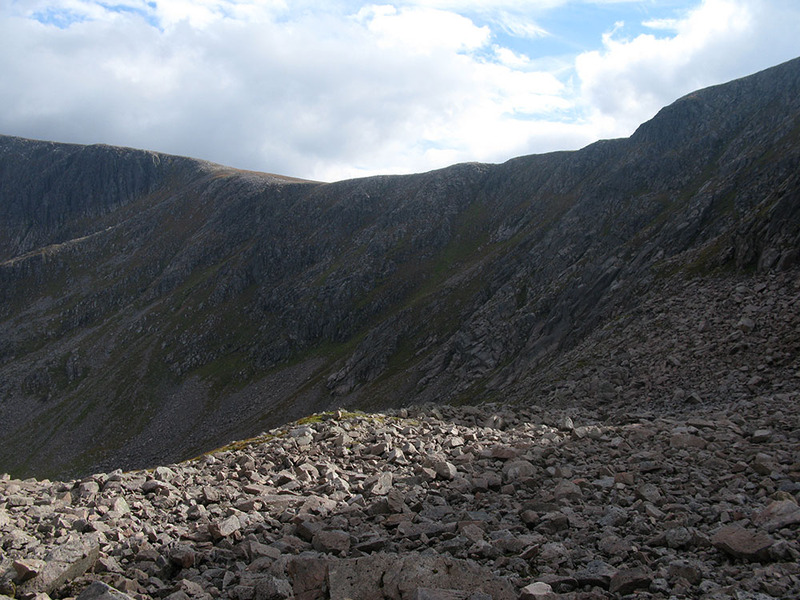 The two papers focus on different areas of the Cairngorm mountains; the Harrison et al. paper describes a computer model that uses local historic and contemporary meteorological records and a Digital Elevation Model (DEM) to generate snow and ice cover models for various temporal and climate parameters, in the specific area of Garbh Choire Mòr (and the other corries of Braeriach as well as the northern corries); the Kirkbride et al. 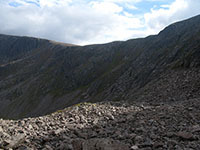 paper describes an isotope ratio dating technique used on rocks in Coire an Lochain, one of the northern corries of the Cairngorms. Two of my photographs of Garbh Choire Mòr (which can be seen here and here) were used in the Harrison et al. paper. The Harrison et al. paper (corresponding author: Stephan Harrison of the University of Exeter) essentially describes ‘desktop science’ using a computer model, and concludes that the snow and ice features that are predicted by the model using climate variables (e.g. precipitation and air temperature) that may have been evident during the period of the LIA, indicate the probable presence of ‘glaciers’ at that time in the corries of Braeriach, and the northern corries of Coire an Lochain and Coire an t-Sneachda. Despite its very genuine and useful methods of analysis which add concrete quantitative results to the debate, the Harrison et al. paper doesn’t seem to recognise the limitations of this method of scientific enquiry, ignores (or doesn’t have the resources to investigate) the ‘ground truth’ that can only be explored properly with on-site fieldwork, and jumps to conclusions that do not appear to be well-justified. The model in the paper predicts (strictly speaking that should be ‘postdicts’) relatively large surface areas and depths of snow and ice in the Braeriach and northern corries during the LIA (which is not in disagreement with other researchers, including Adam Watson), but the conclusion the paper makes that these snow and ice features were actually glaciers, appears to rest entirely on the (remote) analysis of the geomorphology of a rock ridge and surrounding topography in Garbh Choire Mòr, and the findings of the rock dating techniques in Coire an Lochain in the Kirkbride et al paper; this is contentious, as explained below. Another limitation of the model used in the Harrison et al. paper is the resolution of the DEM used, which is 30m. A resolution as coarse as this potentially misses some of the smaller topographical variability of the real landscape which can affect the calculated results – the rock ridge in Garbh Choire Mòr is of the order of 30m in length, and smaller gullies than this in Garbh Choire Mòr ‘funnel’ avalanched snow from the mountain plateau above to locations that correspond to the locations of the current persistent snowpatches in Garbh Choire Mòr. Higher resolution DEM data is available such as NEXTMap data which offers sub-10m resolution data. Computer-based modelling techniques like this this are a bit of a pet interest of mine, and the model described in this paper has a lot in common with the Geographical Information Science (GIS) methods I outlined in one of my blog entries I wrote in 2011 about using GIS techniques to analyse snowpatches (http://www.edwardboyle.com/blog/?p=1621). A paper (Purves R S, Mackaness W A, Sugden D E. 1999. An approach to modelling the impact of snow drift on glaciation in the Cairngorm Mountains, Scotland. Journal of Quaternary Science 14; contributed to by William Mackaness who was my supervisor on my 2010 GIS MSc course) which is referenced by the Harrison et al. paper uses a similar desktop modelling technique and this work was a model for my blog entry (which contains preliminary work carried out for my proposed MSc dissertation, which unfortunately never happened). The Kirkbride et al. paper (corresponding author: Martin Kirkbride of the University of Dundee) describes a dating technique that was used to date rock ridges in Coire an Lochain. This dating technique uses Beryllium isotope ratios in the rocks, which is a proxy measurement for exposure to an ‘unshielded’ environment. Using this dating technique the paper arrives at the conclusion that a glacier existed in the corrie, on the rock face of the Great Slab, much more recently than the end of the Younger Dryas stadial, 11,500 years ago (see the image to the left for an idea of the extent of the glacier on a map of the corrie; this is strictly my own interpretation of the putative glacier discussed in the paper; see also this image from the University of Dundee website which is a mockup of how the glacier might have looked). The dating of this glacier to the specific period of the LIA is supported by one of the contributing authors of the paper, Alastair Dawson, who wrote the book So Foul and Fair a Day (Dawson, Birlinn Ltd, 2009), about Scotland’s climate. However, from the details in the Kirkbride et al. paper it’s not clear that the results obtained using this dating method cannot be alternatively (and perhaps more satisfactorily) explained by a large extent and depth of ‘inactive’ perennial snow and ice covering the rocks, which is not necessarily a ‘glacier’, and there doesn’t seem to be any difference in this respect between this dating technique and those used by Sheila Rapson in her 1990 SMC Journal article and 1985 Boreas paper (radiocarbon dating and pollen analysis), or even David Sugden’s 1977 CCJ article and 1971 Geographical Journal article (lichenometry). There is a rock ridge in Garbh Choire Mòr which is a notable and unusual feature in the corrie (see a photograph of this ridge to the right). A lot of the debate has centred on the geomorphology of this ridge, what its origins are, and whether it is a moraine (formed due to the action of glacial ice) or a protalus rampart (formed from rock debris on a snow surface rather than glacial ice). Concerning the geomorphology of the rock ridge in Garbh Choire Mòr (and also perhaps the rock ridges in Coire an Lochain) Adam Watson has said “It is not a moraine or fluvioglacial deposit or till unless it shows horizon development. A protalus rampart has no obvious horizon development because of the frequent accumulation of fresh topsoil and vegetation leading to topsoil by decomposition“. Adam Watson has also said that this ridge is more likely to be a protalus rampart rather than a glacial moraine, and has stated “Both the 2014 papers state clearly that there was no soil profile in the supposed morainic ridges that they described. This rules out moraines without further ado“. The Harrison et al. paper mentions this rock ridge and says “the clearest boulder ridge…is too far from the foot of the talus slope at the backwall of the cirque for it to have formed by pronival processes“. The Kirkbride et al. paper says (about the rock ridges in Coire an Lochain) “soil cover is thin with no horizon development“, but there is no evidence or explanation for this claim, and no reference to any previous fieldwork or research in the area to support it. The Kirkbride et al. paper also says “reconnaissance of several cirques has produced evidence of pronival deposition rather than Holocene moraines“. It would be useful to know which ‘cirques’ these were and how they came to this conclusion – effectively it is saying that the moraines they describe in Coire an Lochain are unique features in the Cairngorms. Does this uniqueness also include Garbh Choire Mòr? If so, this is in direct contradiction to the claims made in the Harrison et al. paper. Also, the Harrison et al. paper says, somewhat brusquely, and in apparent contradiction to the Kirkbride et al. paper “We dismiss arguments that the small boulder ridges in several high cirques are protalus, pronival or avalanche landforms…“). Again, more detail about these locations and support for these conclusions would be welcome. The Harrison et al. paper even says of these proposed late-Holocene glaciers “…such glaciers were unlikely to have been dynamic enough to excavate pre-existing material from sub-glacial positions” which seems to imply that the rock ridge features that are being discussed weren’t actually formed or modified by moraine-forming ‘glacial’ ice at all. Iain Cameron and Mark Atkinson visited Garbh Choire Mòr in September 2012 to carry out some fieldwork, by digging a small trench in the rock ridge in this corrie, which seemed to confirm Adam Watson’s hypothesis (see photographs and a video of this activity). Iain Cameron has said about this feature “avalanche debris can be often be found as late as August in the hollow which is adjacent to the ridge. Attila’s photo from 2008 shows this well. http://www.flickr.com/x/t/0090009/photos/28183399@N03/11869287543/” and “the explanation given by Sandy Walker (via Adam) as to what to look for did seem to suggest the protalus option“. It is apparent from reading the Harrison et al. paper that no on-site fieldwork was carried out for the research outlined in the paper (perhaps due to its relative inaccessibility), and this may be a weakness in the research carried out in that paper. The inaccessibility of the Braeriach corries (and Garbh Choire Mòr in particular) is definitely a hurdle to effective scientific research and enquiry. In fact the Kirkbride et al. paper touches on this when it says about Coire an Lochain “The irony is that the elusive landform evidence for recent glacial activity was discovered in one of the most visible locations in the massif“, being as it is, about an hour’s easy walk from the ski centre car park. The Harrison et al. paper refers to the conclusions of the Kirkbride et al. paper to support its own conclusions. It’s not clear what fieldwork was carried out for the Kirkbride et al. paper, apart from rocks which were removed from the surfaces of the rock ridges in Coire an Lochain for use in the lab-based Beryllium isotope dating technique. The Kirkbride et al. paper, in turn, uses the computer modelling of the Harrison paper to support its conclusions. It is worth pointing out that two of the authors of the Kirkbride et al. paper have written a detailed rebuttal to Adam Watson’s views here. It’s a confusing picture, and there is by no means a consensus about this. There is a lack of depth and clarity in both papers I think, with reference to the term ‘glacial ice’ and what this actually means, and what is meant by referring to a feature as a ‘glacier’. The Harrison et al. paper says “The LIA simulations produced small glaciers within each of the cirques, and perennial snow and ice cover on many of the ridges and headwalls within the model domain“, but seems to use an apparently somewhat arbitrary extent and depth measurement to define a feature as a ‘glacier’ as opposed to an area of ‘snow and ice’. A ‘glacier’ can be defined as a body of ice that has certain characteristics: it has a minimum depth of layers of annual unmelted snowfall which causes lower layers of snow and ice to be pressurised above a certain density and deformed; this ice flows due to gravity, and the ice modifies the landscape around it as it flows (i.e. moraines). So at the core of this debate is the issue of whether the features that are being discussed display these characteristics – but at what point does a large and perennial snowfield (of which there are small contemporary versions in the Scottish mountains) become a ‘glacier’? A term I’d like to see popularised is ‘glacieret’ (the term ‘proto-glacier’ has also been used in this context) which has already been used (in academic papers) to describe features in other countries which are relatively large perennial and persistent snowpatches that may contain very old ‘fossil ice’ but which aren’t actually glaciers in the true sense in that they may not contain ‘active’ ice that is deformed, flows, and modifies the surrounding rock topography (e.g. the Calderone ‘glacier’ in Italy, the Snezhnika snowpatch in Bulgaria, the Debeli Namet ‘glacier’ in Montenegro, the Hamaguri-yuki and Kuranosuke ‘snowfields’ in Japan, Saint Mary’s ‘glacier’ in Colorado, I go into detail about this in another blog posting at: http://www.edwardboyle.com/blog/?p=1234). There are lots of examples of these types of features, and it might be more useful (and correct) to say that a feature like these (probably) existed in the Braeriach corries in the period of the LIA, rather than an actual ‘glacier’. A list of relevant academic papers and articles can be seen at the bottom of this page on my website: http://www.edwardboyle.com/drupal/snowpatches_resources. Another problem with the idea that a glacier existed in Coire an Lochain in the period of the LIA is that this corrie is actually easily visible from the surrounding lower-lying inhabited areas of the Spey Valley such as Nethy Bridge and Grantown-on-Spey (the corrie is well-seen from Loch Morlich, for instance). Eye-witness accounts of persistent and large snowfields in the Cairngorms go back many years, right into this period. A detailed collection of these historical accounts can be seen in the book Cool Britannia (Watson & Cameron, Paragon Publishing, 2010). The crucial point about these accounts is that they do not mention anything out of the ordinary in Coire an Lochain – the large persistent snowfield of Ciste Mhearad is mentioned in accounts from the 17th to 19th centuries, as well as snowpatches in Garbh Choire Mòr (both of which are not visible from the lower ground in the Spey Valley) – but Coire an Lochain (which is) never merits a mention. If there was a glacier in this corrie at some point in the 17th to 19th centuries it would surely have been mentioned specifically in these historical accounts. In contemporary times, Coire an Lochain contains some relatively long-lasting snowpatches but is not known as one of the main areas of snow in the Scottish mountains that persists into the following winter. It’s worth stressing also that the Kirkbride et al. paper concludes only that a glacier existed in the corrie later than previously thought (the end of the Younger Dryas stadial) and the period of the LIA is only one option for this (although of course this is the most interesting) – the glacier may well have existed at some other cool period in the last 2800 years, so the lack of historical accounts from the 17th to 19th centuries does not necessarily invalidate the research in this paper, only perhaps making it less interesting to modern and contemporary eyes. So where does all of this leave the debate? The two recent papers have added a lot of new insights and data to the discussion, but do not appear to have provided conclusive evidence or firm conclusions about whether or not glaciers existed in the Scottish mountains within the last few hundred years – there is certainly no consensus about the question or indeed its answer. On either side of the debate, attitudes seem to be fairly entrenched and the debate revolves around the scientific interpretation of data, the methods involved in generating that data and even the semantics of the terminology used (what does the term ‘glacier’ actually mean?) The central question that doesn’t appear to have been satisfactorily resolved is, are the rock ridges in Coire an Lochain and Garbh Choire Mòr (and other places in the Cairngorms) recently-modified glacial moraines or not? However, the two recent papers can be considered as being a welcome spur and catalyst to further research in this area. It is clear that only further research carried out within the usual academic environment (peer-reviewed papers published in ‘respected’ journals by academics associated with well-regarded research institutions such as HEIs, SNH, BGS and CEH) will advance this debate, but I hope that this can be done in collaboration with, and using the very real advantages that can be obtained from, the ‘citizen science‘ approach, which in this area has been carried out in recent years by a large team of interested amateurs who contribute to the annual Scottish snowpatch report in the Weather journal. The Harrison et al. paper does list some of these ‘citizen science’ papers and articles as references (and in particular Adam Watson’s book ‘A snow book, northern Scotland‘), but it’s not clear what effect they have had on this paper, other than as a source of conclusions to refute by the research carried out. The Harrison et al. paper says (about Coire an Lochain and Coire an t-Sneachda) “…under present conditions, these contain the longest lying snow patches in the British Isles”, a conclusion which is not borne out by the results of ‘citizen science’, and ignores the snowpatches in Lochaber and in the area directly to the east of the summit dome of Ben Macdui, which are consistently more persistent than those in Coire an Lochain and Coire an t-Sneachda. The two recent papers have certainly raised public awareness of the issues and the science involved (as can be seen from the BBC news and MCofS website reports) so in this sense, they can be seen as a success. Thanks for this thorough discussion on our papers. It would take me a long time to respond in detail, but I think there are a few points, in no particular order, that should be mentioned. 1 I really don’t see how ‘horizon development’ (whatever that is) differentiates between glacial or nival landforms as Adam watson argues. Glacial geomorphologists would not recognise this as a factor which would help discriminate between moraines and pronival ramparts. If the Garbh Choire Mòr ridge is a LIA moraine it would just have been simply bulldozed and redistributed by the small glacier with little edge rounding of clasts and no need for any ‘horizon development’. Such small glaciers would have been unable to produce much bed transport. 2 we use the term ‘glacier’ because the ice masses formed small bodies of ice that underwent internal deformation and/or sub-ice sliding under gravity. Subglacial sliding may well have been unlikely at Garbh Choire Mòr but could have occurred at Coire an Lochain. 3 you are right that the DEM has rather coarse resolution and we initially used much better resolution data but were not able to publish these for various reasons which I can’t go into here! However, I can confirm that both techniques produced similar ice masses in the corries. The obvious next step is to publish the analysis with finer resolution data. 4 As I have said before, my own view is that the previous existence of LIA glaciers is pretty uncontroversial. Intuitively, it’s not hard to imagine small glaciers in Cairngorm corries at a time when the Thames was freezing over, and when snow patches were lasting until late summer in the Cotswolds of southern England. Given the late lying snow patches now at a time of considerable global warmth, it seems clear these these must have been much bigger in the past. Our modelling shows that such sites are very sensitive to small changes in MAT and precipitation, with only a drop of -1.5C producing substantial glaciers (although the model is allowed to run to equilibrium). 5 Our paper was model-based and this is why we only published it as a short paper in the journal and in conjunction with Martin’s paper. We were also restricted with respect to word count which is why we had to be rather brusque at times. Obviously there is much more work to be done here, but the two papers are complementary and support each other with a range of relevant scientific techniques. As I have said before, the way for others to take this forward is either to write a reply to the journal or to submit other analyses for publication in the scientific literature. I’m glad that these have sparked debate. That’s how science moves forward! A photograph of Garbh Choire Mòr taken by Adam Watson in August 1975, and contained in Iain Cameron’s Flickr archive, shows very well how late-lying snow collects close to the rock ridge in the corrie – does this lend support to the theory that this ridge (rather than being a recently-formed glacial moraine) is composed of rockfall, avalanche and windblown debris that travels along the surface of the late-lying snow towards the ridge? Just looked at your great photos from Ben Nevis of the recent snow patches. Do you have any photos from the upper part of Corrie Leis on the Ben?